When distinguished guests, including the WHO Representative to Malaysia, Brunei and Singapore, Dr Jaqueline Lo joined Malaysia’s Director General of Health, Datuk Dr Noor Hisham Abdullah on stage, little did they expect to be launching the Western Pacific Cataract Surgery Outcomes Meeting with the banging of a traditional Malaysian gong! But then the launch of the meeting at Shah Alam Hospital on the outskirts of Kuala Lumpur was anything but typical: it was a joint meeting of WHO and IAPB – the first-ever held in Malaysia – with representatives from both WHO member states and IAPB member organisations. The meeting was tackling a topic that is often considered taboo and yet a topic that Malaysia has already made great strides in addressing. As Dr Hisham noted in his opening address, there is an essential need to increase the number of cataract surgeries performed. Globally, cataract remains the number one cause of avoidable blindness. Yet there is also a parallel need to ensure that this increase in quantity is not at the sacrifice of quality outcomes. All too often, poor choices in pre-surgery screening result in poor post-surgery outcomes across our region. In Papua New Guinea for example, 36% of post cataract surgery patients cannot see 6/60 and blindness caused by cataract surgery is 1.5%. 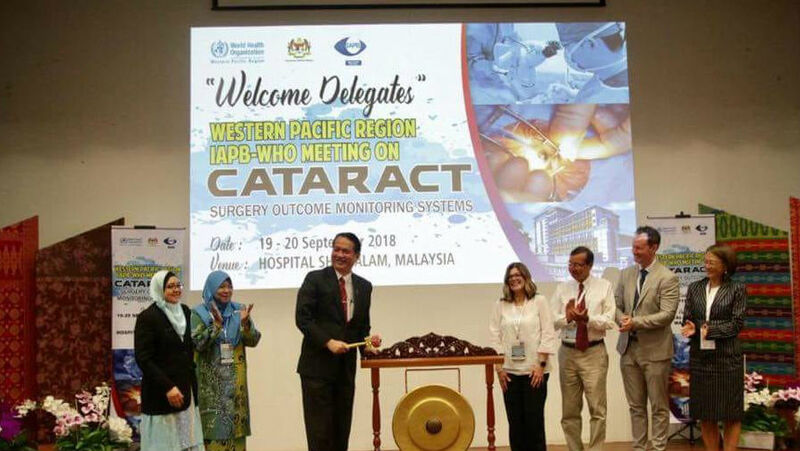 By contrast, Dr Mohammad Aziz Salowi, Malaysia’s Public Health ophthalmologist and a driving force behind this meeting presented the situation in Malaysia: almost 50,000 cataract surgeries performed in 2017, yet less than 0.2% post-surgery complications. One reason for Malaysia’s standing in the region is the decade-long use of a system called “E-Cusum” for tracking cataract surgery outcomes. Since its introduction there has been a marked decline in poor outcomes – hence the decision to host this meeting in Malaysia. The system was show-cased together with the recently launched BOOST cataract tool – Professor Nathan Congdon from Queen’s University, Belfast was on-hand to workshop the tool with international participants. Integration of optometry within the ophthalmology department has also brought improved outcomes. Dr Elias Hussein, Head of Ophthalmology at Kuala Lumpur General Hospital, explained that high quality refraction and pre-surgical work up performed by optometrists has significantly improved cataract surgery case selection – there are now some 500 optometrists working within the eye clinics of Malaysia’s public hospitals. In showcasing these tools and other developments, the meeting was aiming to be a conversation starter. As Professor Serge Resnikoff from ICO noted, there is no magic one-size-fits all solution to the problem; it is essential to raise awareness so that Ministries of Health can identify problems and take appropriate action. It’s also important to view the problem from a variety of perspectives – for example through a gender lens as presented by Dr Noor Fariza, Chair of Malaysia’s PBL and Jennifer Gersbeck, Chair of the IAPB Gender Equity Working Group. But the final word must go to Dr Andreas Mueller, Eye Health Consultant to WHO in the Western Pacific, “increasing Cataract Surgery quantity without a focus on quality is bordering on the unethical”. No such issues for out hosts in Malaysia.